This economically-priced diamond disc is ideal for detailed grinding work on hardened metals, EDM'ed surfaces, or welded areas. Very popular for grinding subgates on plastic injection molds as well as deburring stainless steel parts. 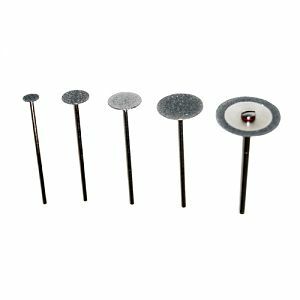 Diamond pins hold up where other small grinding wheels would crumble. DE8220 has a 3mm diamond coated rim, is a disc mounted to a 1/8"dia. mandrel (disc is not available separate). All of the other diamond disc's coated diamond area, equals each of their total diameter and are brazed to a 3/32" shank.